What would Maggie have said? | Curly's Corner Shop, the blog! What would Maggie have said? 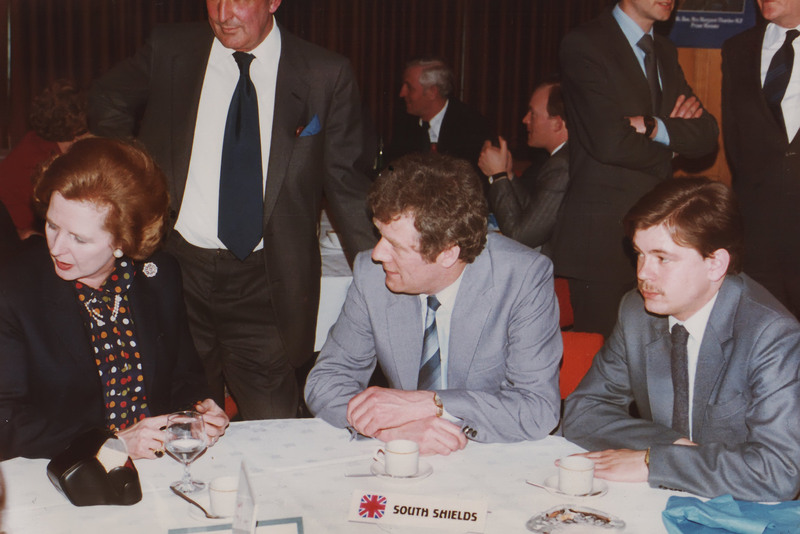 I’m very grateful to former South Shields councillor George Wilkinson who unearthed these pictures from his family album showing George and a very younger yours truly in talks with the then Prime Minister Margaret Thatcher. 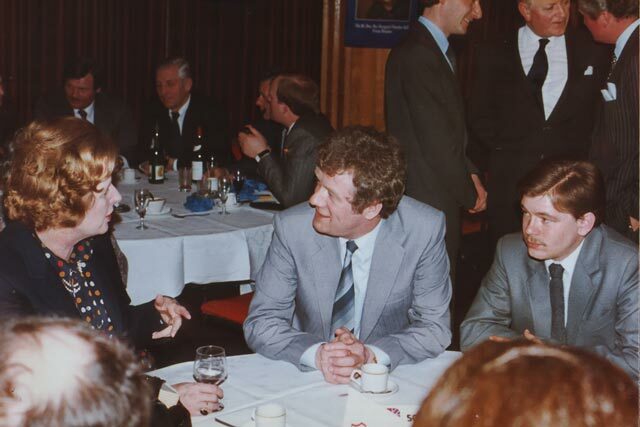 The pictures were taken in March 1982 at the Five Bridges Hotel in Gateshead at a Conservative Party function, Maggie was fond of visiting the regions to find out first hand what the feelings of the party were, and always relished the opportunity to meet others too, as she kept herself well informed about the state of the nation. She visited the north-east many times whilst Leader of the Opposition and also as Prime Minister and this was one of a number of occasions that I was fortunate enough to bend her ear! I wonder how she might have handled our recent woes? How would she have dealt with the Northern Rock collapse and the banking crisis of 2008? Would she have allowed the UK to participate in such a massive banking bail out, and would she have contributed so much to the IMF and the ECB to bail out other European nations who were unable to deal with their own deficits and debt mountains? Would she have allowed any Chancellor of hers to build up such massive debts as those accrued by Gordon Brown and Alistair Darling? I was about 25 years old at the time of this meeting, having been a mostly green and wet behind the ears Progressive councillor for the Beacon and Bents ward, to be honest and truthful until George told me about these photographs I’d forgotten all about this visit, even now I haven’t got a clue about what we might have been discussing. I do recall a later meeting in Seaton Delaval Hall when she discussed the beauty of The Leas and the coastline in South Shields and how she hoped that they would always be there for the public to enjoy, that was long before they were entrusted the The National Trust for safekeeping, at a meeting at the late Lord Elliot’s home in Northumberland we discussed how the miner’s strike was affecting their families and the hardships they were enduring, I was a little surprised at her concern. However, this meeting has me beaten, perhaps George can help out. So readers, what do you think Maggie was telling us? How do you think she would have dealt with the debt crisis? Instead of bending her ear you should have bent her neck until it snapped! Careful, Neil, that could be construed as a threatening message by some diligent enforcers of the 2003 Communications Act s127. Whatever, one’s political colour, the seemingly chaotic Euro situation should be cause for concern with its implications for employment and financial stability in the UK. No one can afford to be complacent. Regarding government “debt”, can we please draw a distinction between wasteful, frivolous spending and what I would describe as investment in worthwhile life improving projects and schemes creating productive, well paid public and private sector employment, remembering that those employees pay taxes, local and national, as do the businesses created or expanded. Better a holistic than a doleistic society/community. Watch “Garrows Law” and ponder whether or not the lot of the working classes would have ever improved without political and legal radicalism during the past 200 years. “Concern for miner’s families”, well that will go down well in Ashington, Hetton, South Moor et al. Is that the former pipe smoking expenses grabbing MP Derek Foster at the table behind Curly? Did she not suggest keeping a beady eye on him in the future? Don’t think she’d want to be part of this new European club set up Curly, she’s probably preaching the economics of the grocer’s shop, or in your case the Corner Shop. Anyway, thought she always drank scotch, did someone forget? I am tempted to say that she was remarking on the bizarre hair do and the apology for a ‘tache. But …hey it was the early eighties. She was probably telling you that she would be ably assisting in the destruction of heavy industry in the North East and selling off the family silver in the shape of gas and electricity and locally run savings banks and building societies. Thus leading us to the situation we are in now where profits for once publicly owned industries are soaring and old folk can’t put the heating on and where formerly respectable institutions like Northern Rock were plundered with the tax payer picking up the tab. Not to mention the executives staggering off into trhe sunset weighed down by their pay offs whilst the workers lost their jobs. Was she asking which one of you was in the Italian Job, and which one was in Death Wish? Ispy you’d better blame her allowing Tony Bliar to take up where she left off, unfortunately he left the Treasury plunderer and blunderer in charge of the shop, and didn’t he make a fine mess of it all. I note today that Labour had plans to secretly sell off Northern Rock too, yet young Red Ed has the nerve to lambaste Osborne for doing exactly the same. I think she’s probably saying something along the lines of ” Do you not think this beautiful coastline of yours is spoiled by that horrible pit building? Let me get rid of it for you” …..and the rest, as they say, is history. I could agree with you, but then both of us would be wrong. So you’re the person who started off this whole “Movember” thing!